Here are some of the first pictures I took when I got the camera. They give you an idea about still image quality. 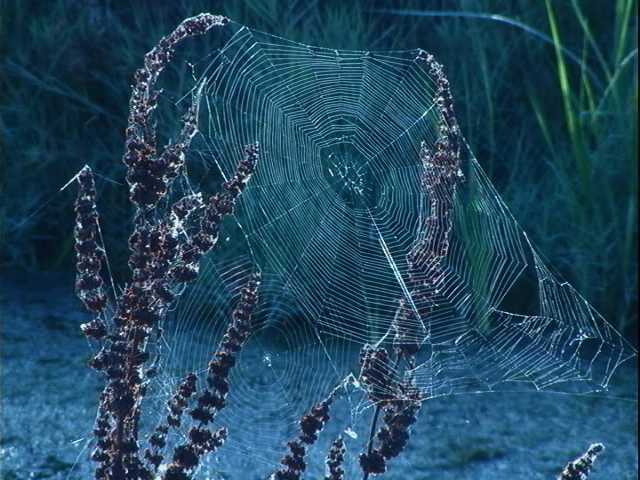 Click on any image to see it at 640x480 (saved as progressive JPEG, Q=70%). Click on the "FULL SIZE" box below the image for the highest quality, straight from the TRV900's floppy drive to the PC (using what Sony calls "superfine mode", ie the best of three available quality levels.) The Q70 JPEGs are about 40k and the full-size JPEGs are about 170k in size. I shot these pictures as a video in progressive mode, then selected the individual frames to write on the floppy later while playing the tape back. The ability to run normal, 2x, slow, still, and frame-by-frame, then transfer a frame to floppy all using the remote, is a very nice feature. Of course, slow and still frames are crystal-clear. 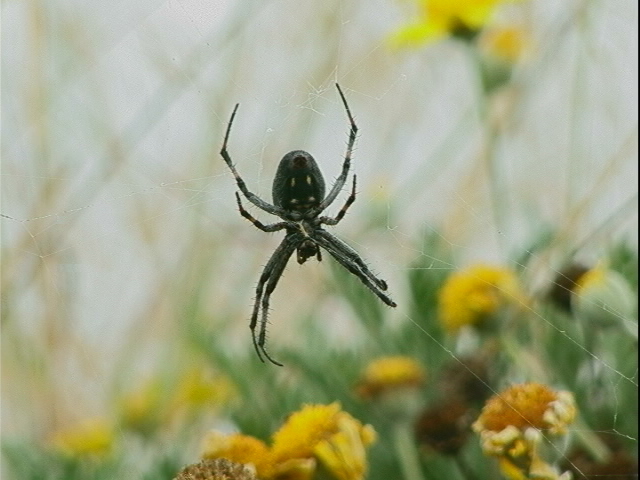 On the "spider" shot, I was impressed to see the spiderweb threads come out, since this spider (and web) was waving rapidly over the entire field of view due to the wind. The first two images above are exactly as they came off the floppy. The last image was somewhat dull, so I increased the contrast using a paint program. These pictures were taken near the shore of the SF Bay (in Mountain View, CA) on Sept. 9/10, 1998 by me (John Beale). It hadn't been 24 hours since I got the camera- I'm still on the learning curve. Here are yet a few more. I have here only the thumbnails and medium-scale images, the full size ones won't fit in my current web directory. (Heh- who says I have to hold the camera horizontal?) 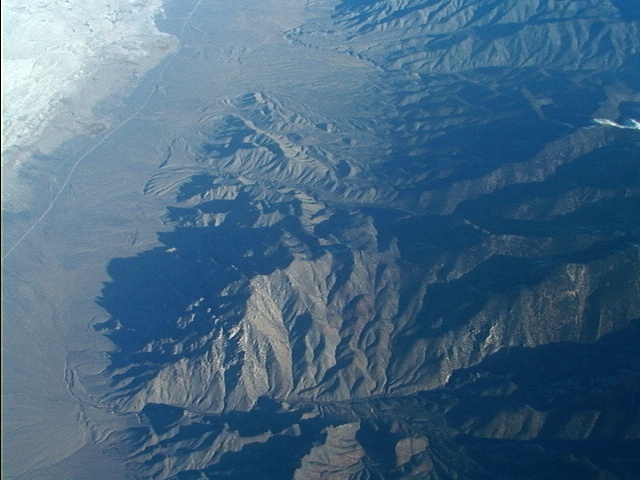 The aerial view is from an airplane window at 27k feet (somewhere between San Francisco and Dallas, possibly New Mexico). Too-dark picture: if you try to take a picture in NO light, it doesn't look good. 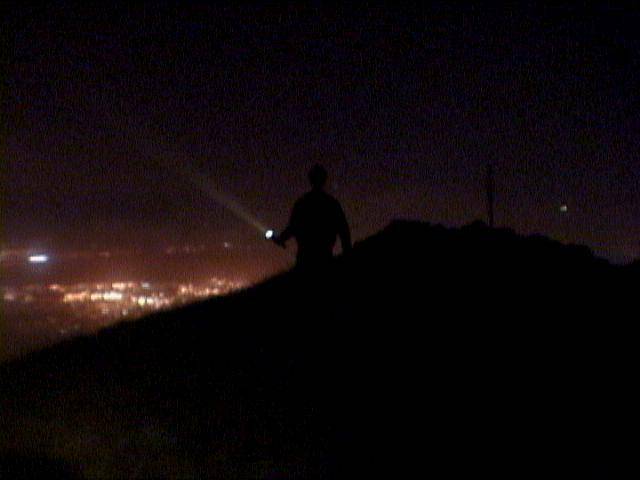 Here is me on Mission Peak with a flashlight, two hours after sunset. The lights of Fremont in the background, shining through a medium-heavy fog hanging over the peak, provide the only light. 1/4 sec exposure. I bought the little combo 3W video light and still flash unit and tried it out in dim light. The images below show the results: top row is normal (interlaced) video, and the bottom row is progressive scan. 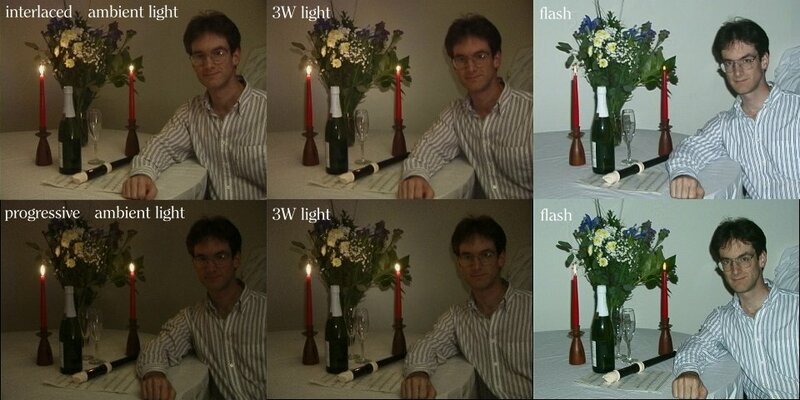 Column 1 is existing light, column 2 is with the 3W video light, and column 3 is using the flash. The 3W video light is only barely visible, and it illuminates only the center of the frame, not the edges. The flash is much more effective. Note that the flash won't work with moving video, it goes off when you press the "photo" button in video mode that copies over the same single frame for about seven seconds on the tape. All these images are unprocessed, straight from the PCMCIA card (they are reduced in size and recompressed). Note that, like most TRV900 image captures, these do appear darker on the computer screen than on the TV screen. Test details: I'm 5 feet from the camera, and the wall behind me is 10 feet away. The "natural" light is from a single 100 watt halogen flood, used indirect (it is aimed at the ceiling, about 3 feet in front of me. The existing light where I am is almost too dim to read by, but you can easily see by it. It is darker than normal indoor lighting, more like a dim restaurant. The camera lens is set moderate wide (if 1=max wide and 10=max telephoto, it's at 3). All camera exposures are at 1/60th of a second, in fully auto mode. The exposure that the camera chose was wide open, +15 dB gain in interlaced and +18 db in progressive mode for the non-flash shots, and f/4, +0 dB for the flash shots. Note that the "progressive" mode is one stop darker than the normal interlaced video, for some reason. It's probably worth mentioning the photo button works differently than a conventional film camera with flash (where halfway focuses, and full press takes the photo). The '900 is always autofocusing; when you press "photo" halfway down the camera actually takes a flash picture, holding it on the screen saying "CAPTURE". However it has NOT been saved. 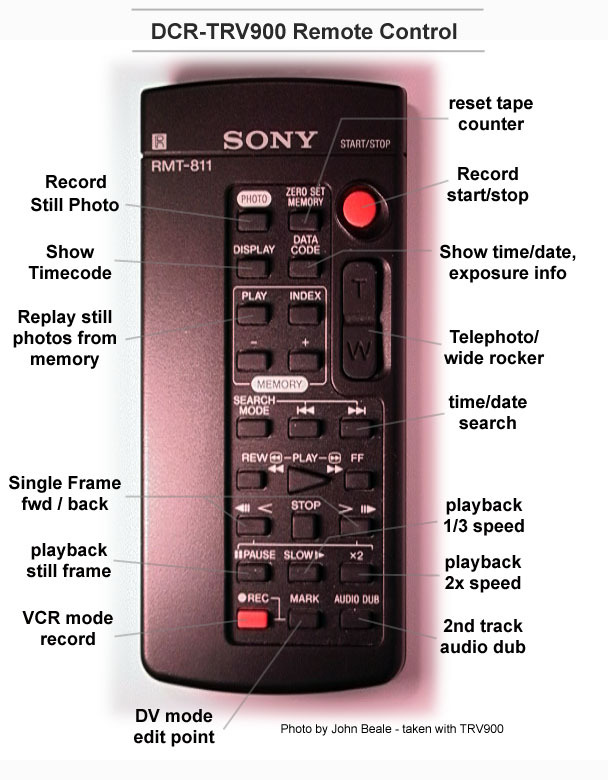 You have to continue to press the photo button down harder before the red progress bar appears and the image is stored on your tape or PC card, and if you don't, it's gone. A little non-intuitive, and takes some explaining if you hand your camera to a friend to take your picture. 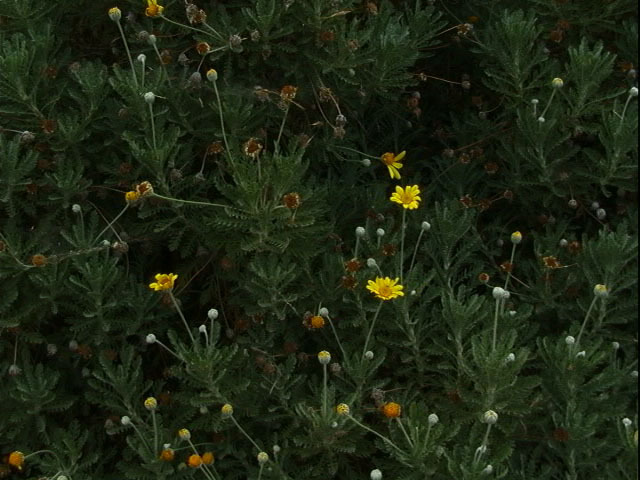 The 3W video light is rather focused, so it illuminates only the area near the flowers, at this wide lens setting. The specs say 100 lux/1m, 25 lux/2m, 12 lux/3m, lighting angle 20 degrees. The color balance shifts when using the flash, but of course this can be fixed in post-processing. The flash has a built-in sensor to adjust the flash energy, but if I have my face any closer than 3' away, the flash will overexpose it anyway. The video light is rated for 100 hours and is replaceable (halogen lamp XB-3D). The flash bulb is rated for 1500 flashes and no mention is made of replacing that. The mount is fixed so you can't angle for a bounce flash; in any case the maximum useful range is about 10 feet. Timing: the flash is variable-power, so if you take a close-up shot it may not use all the stored energy in the capacitors and so will charge up more quickly. However, normally you'll use the full power, and in that case the recycle time is about 5 seconds. It takes 2 seconds (approx.) to write the still to the memory card, so that's three extra seconds of dead time if you need to take another flash shot. If you're writing a still to tape, that uses 7 seconds so there will be no dead time beyond that. Conclusions: 3 watts of light is at the lower edge of being useful for video. It helps proportionally more if you're using 1/30 second or slower shutter speed. The flash works quite well for stills. Sony is charging $150 for this combo which seems like a lot. Since people have asked, here is an example image which was not taken by the TRV900. It's a 35mm photo, scanned in, displayed on my PC screen with a Matrox Rainbow-Runner generating S-Video output, which went into the TRV900 S-Video port. 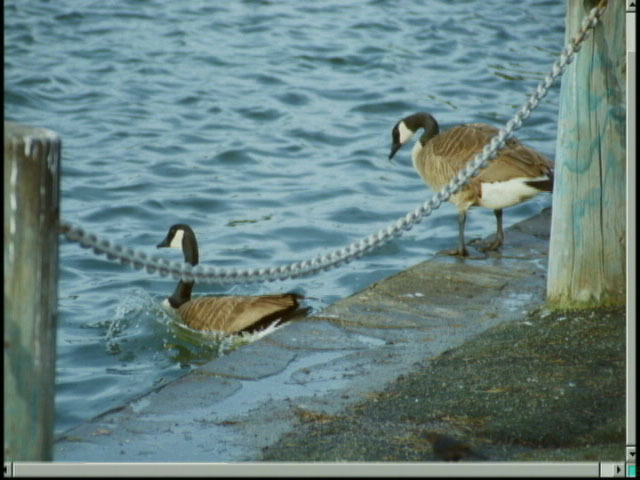 I recorded it as live video to a DV tape in the camera, and then captured it on DV playback in the camera and wrote it as a JPEG to the PCMCIA card. This is the JPEG file straight from the PCMCIA card (except that I renamed it). The post in the foreground was originally out of focus. The post in the background was originally sharp. 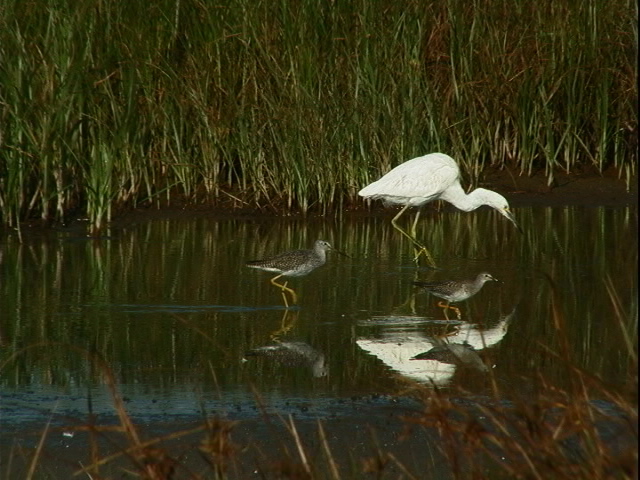 The capture is fuzzier than the original, but I don't see any obvious noise. Note that this is a "normal" video capture and not "progressive-scan", which AFAIK doesn't work with external video in. I think pictures originally taken with the TRV900 look sharper than those sent through the S-Video in. I also have a more comprehensive look at resolution and image quality with this camera. I also have some capture examples from what is perhaps the ultimate "night-shot" type camera. In the days when H.E. 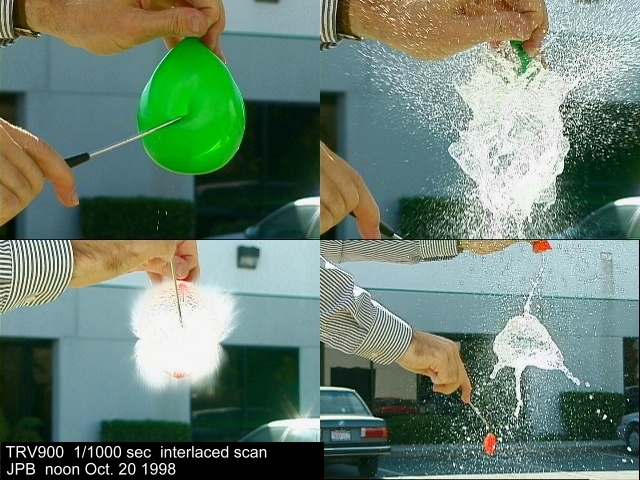 "Doc" Edgerton inagurated high-speed photography with his electronic flash, it took a lot of equipment to get those remarkable shots of milk drops forming a crown shaped splash, or a bullet flying through an apple. I'm not saying it's easy to create images that good, but the TRV900 can take a continuous stream of images with fast shutter speeds (up to 1/10,000 second). Other cameras can do this, but the '900 makes it easier to transfer the best frames afterwards to your PC. On my lunch break yesterday I popped some water balloons- below are some of the more interesting frames. This was done with interlaced video at 1/1000 second exposure (I'd intended to use the higher-resolution progressive scan, but forgot to set it!). You want a lot of light for such short exposures- I angled the camera so the midday sun lights the water from behind and above. It looks like I could benefit from even faster shutters at the moment the balloon breaks (bottom left image). You can get some really interesting shapes in the water- I'm curious to explore further, now that my camera has shown me these remarkable but brief water sculptures. 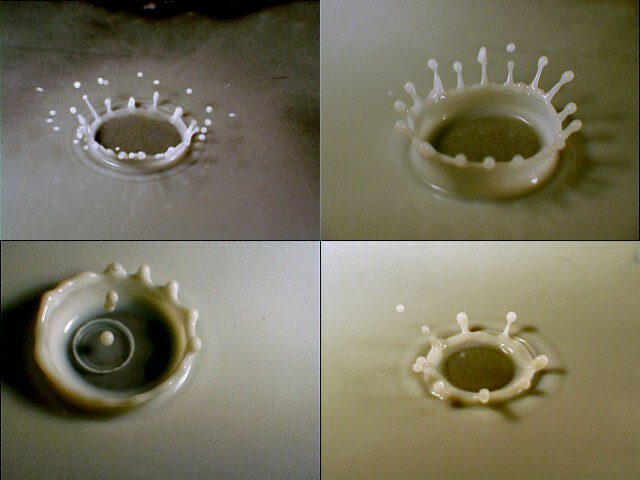 The milk drops splashing onto a plate were done at 1/1000 and 1/2000 with the close-up lens described in the next section. The TRV900 doesn't have an interchangable lens; the 12x zoom lens is built-in. However, it does have a 52mm diameter thread for filters, which is one of the common sizes for 35mm camera lens accessories. 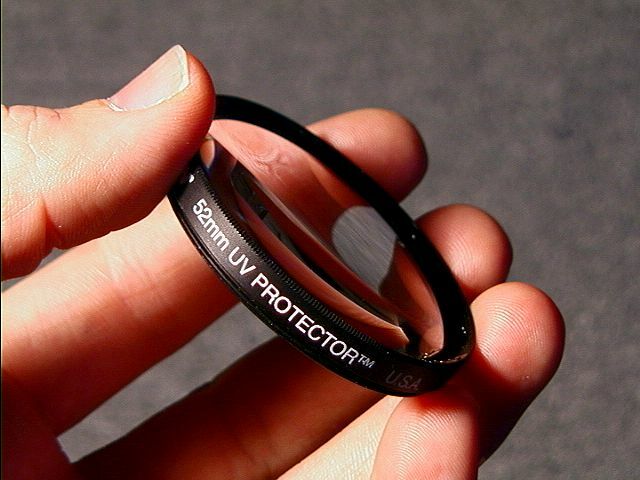 One kind of accessory you can get is a set of "close-up filters" which are actually +1, +2, and +4 diopter lenses. These give you larger images of small objects, at the price of not being able to focus at infinity. I made my own close-up lens from a +7.7 diopter (fl=12.9 cm) lens glued into spare 52mm UV filter ring (image at left, below). 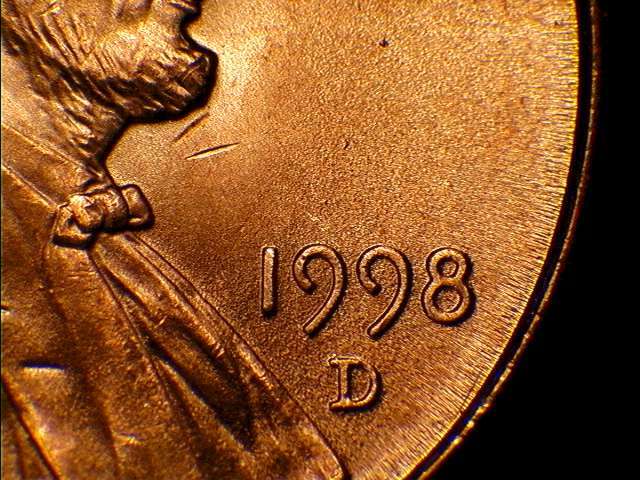 This limits you to very close subjects, about 5" away, but you still have the full range of zoom- note the two views of a common U.S. penny. 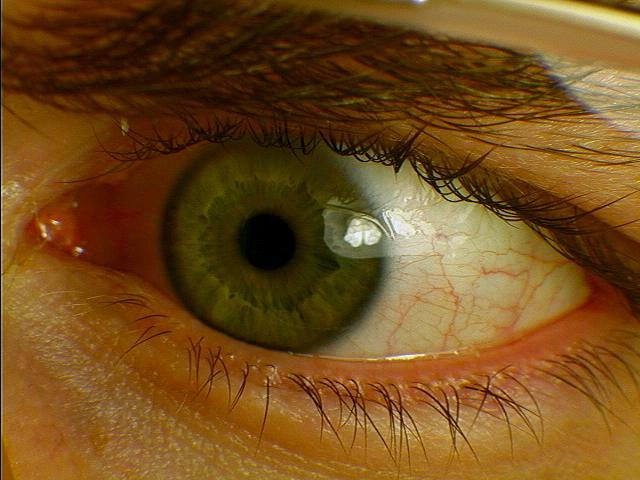 At full zoom you practically have a video microscope (with a tiny depth of field- less than 1 mm!). 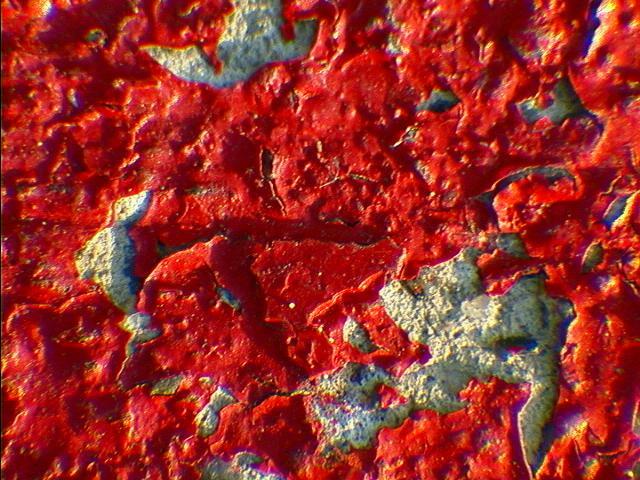 The red texture at right is paint on a street curb (full zoom). Watch out for eyestrain looking at all these interesting pictures (right). You see a lot of color fringing; my close-up lens is not well-enough corrected for this magnification. Perhaps a +7 lens made up of the three standard "close-up filters" stacked together would work better. Several people mentioned they liked the close-ups, so here are two more taken with a +4 and +2 diopter "close-up filter" stacked together. I got the Hoya multicoated 52mm +1,+2,+4 set from Adorama for $40. They may be slightly better than my single +7.7 lens. I'm not sure the multicoating option is worth the doubled price. 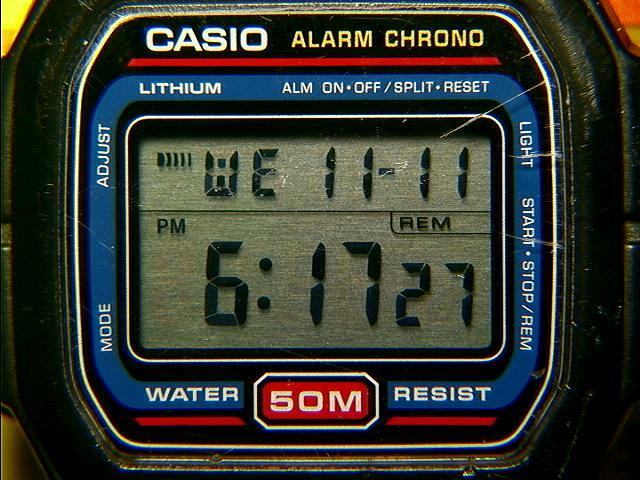 At left: my wristwatch. Due to JPEG re-compression, there are some artifacts on the red background behind "50M" at lower center, which are not present in the original. 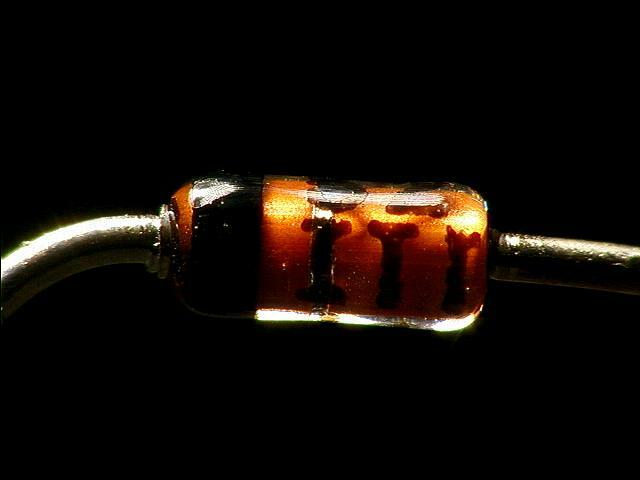 Next: a 1N4152 diode, which is about 3 mm long without the leadwires. Right: I combine a telephoto with close-up lenses. This gives you large magnification at long working distances, good for example with insects. 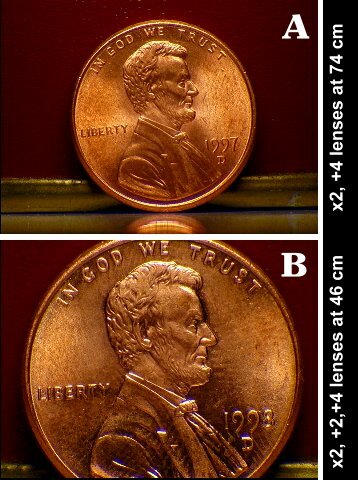 Two views of a penny, using a +4 lens behind a x2 telephoto (A) and +4, +2 and x2 (B). The (B) image has some colored flares, but (A) is quite sharp and this was taken from 29 inches (74 cm) away! 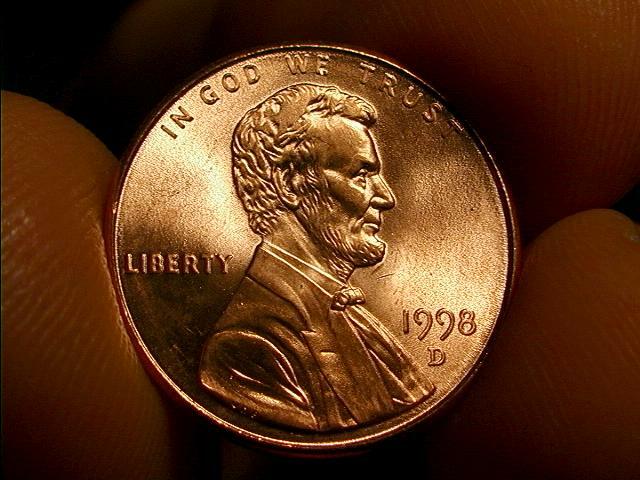 If you didn't know, a penny is 3/4" (19 mm) in diameter, and you can exchange about 210,000 of them for one TRV900. A word about the image on the right, above: people with 35mm cameras who want to do real close-ups use a "T-ring" adaptor and a second lens threaded backwards onto the first lens. The T-ring threads into the filter mount on both lenses, so they are "head-to-head". The TRV900 has a 52mm filter mount and nothing prevents you from doing the same thing with it, as I show in this picture of ordinary table salt. 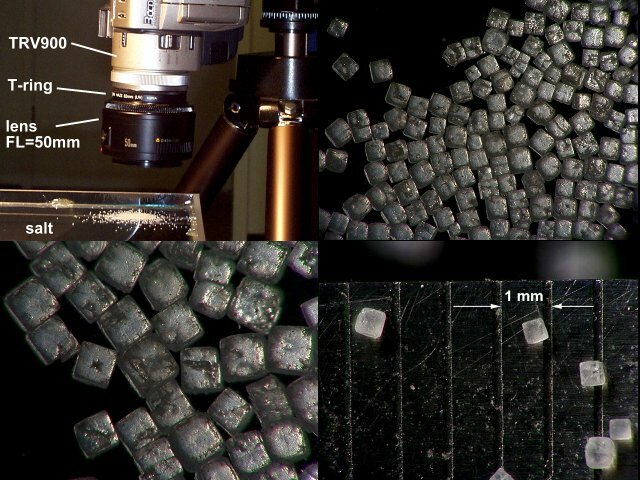 You can see the great enlargement, as the salt grains are about 0.5 mm (.020 inches) across. At lower left I went a step further and added a +4 close-up lens as well, but now chromatic abberation gets noticible esp. at the edges of the frame. This infrared remote comes standard with the camera. I have a picture here showing you the functions of some of the buttons. 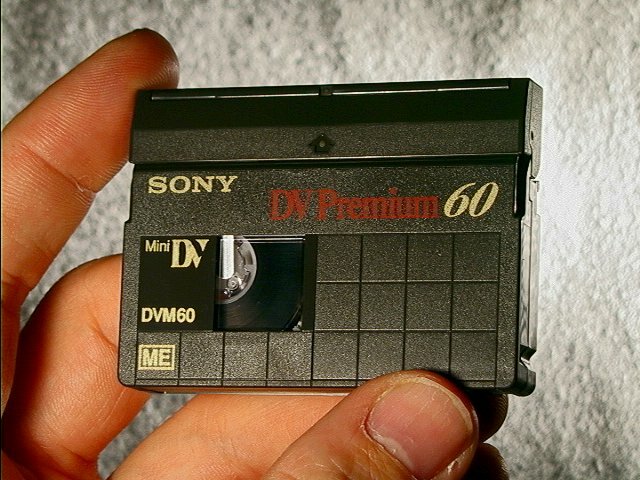 If you haven't used a DV camera before, you might be surprised at the size of the tape it takes. 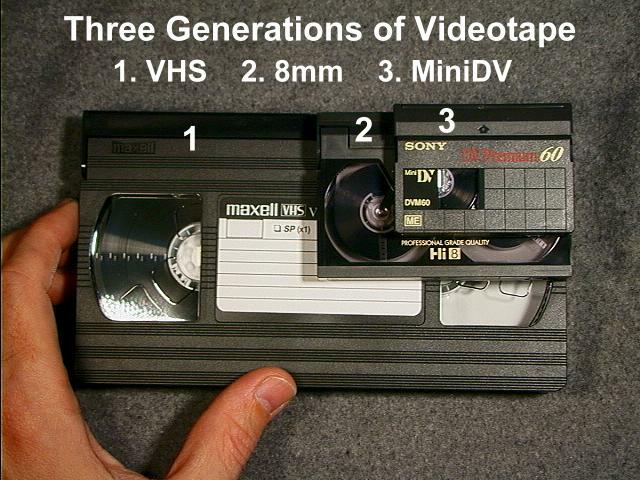 MiniDV tapes are really small, as the two shots below illustrate. Just as with computer chips, the size is going down, and the performance is going up. 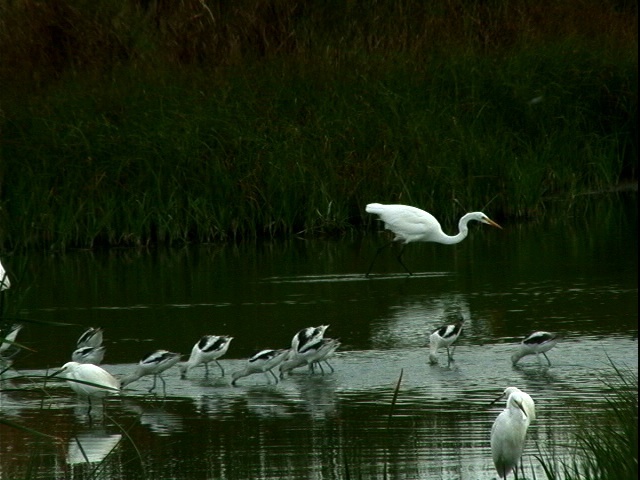 Note: at first I used my Kodak DC120 "megapixel" digital still camera for these shots, then I tried the TRV900. The 900 is much easier to use (immediate feedback on larger LCD screen, better close focus, longer zoom) and I think the JPEGs from the 900 have more real resolution (even though they're only 640x480 !). The shots below are from the TRV900. For some reason the camera records very red objects as if they were out of focus. 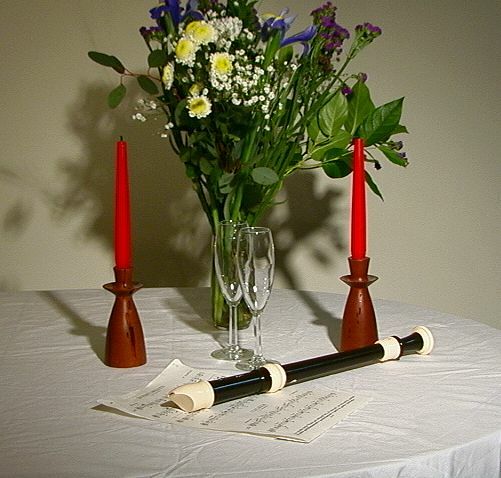 Compare the edge of these red candles (which aren't moving!) 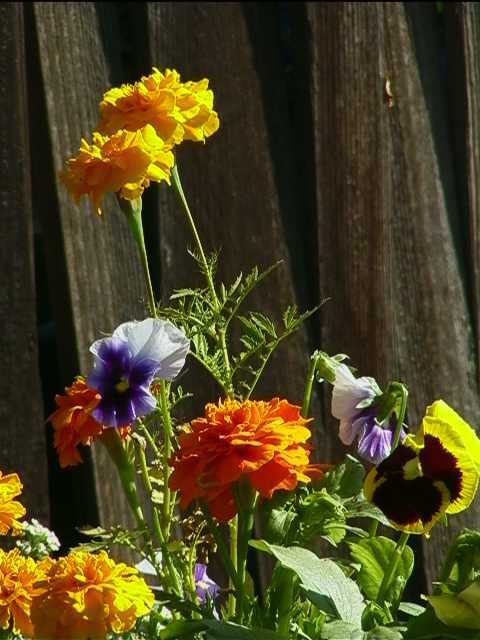 with the sheet music in front of them, and the flowers behind them. It is not an optical focus issue; adjusting manual focus cannot make the red object sharper. The fuzzy reds happen both on still frames and moving video. Actually, fully saturated red is a so-called NTSC illegal color and your TV will probably do even worse than the camera, with the red color bleeding over into adjacent objects, but this is a limitation in the video format itself and unrelated to the camera. I don't know how PAL handles reds. This is the only complaint I have about image quality, and it shows up only on bright red objects. 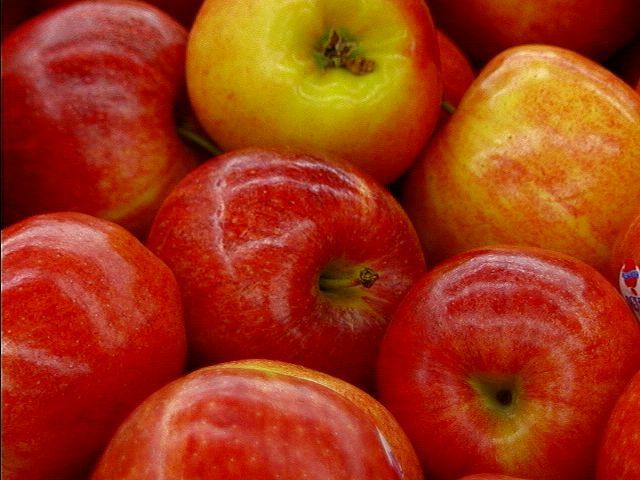 The apple picture doesn't look as bad, but maybe it's just harder to tell. Please examine these pictures yourself to determine the extent of the problem. I would say it is noticible, but not a fatal defect; I had my camera several months before realizing it, and seldom notice it today; it happens only with saturated, candy-apple-red objects. One reader told me that he uses his camera in Taiwan where almost all decorations are red (? ), I would suppose it is more of an issue for him. back to TRV900 main page.